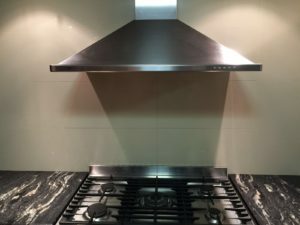 Clean range hood? Appliances such as range hoods can be easily missed while cleaning our home. However, this is an appliance that should be definitely cleaned on regular basis due to all the germs and bacteria that it accumulates. The question is, is it easy to clean? The answer is YES!! The range hood and its filter can be easily cleaned!! Steam the inside area to lose the grease. Simply fill a large pot with water and let it boiling for around one hour. Use an old cloth to remove the first layer of grease. Repeat this process twice or three times if need. Wait until the metallic parts cool down and apply your normal oven cleaning or de-greaser to remove the remaining grease. 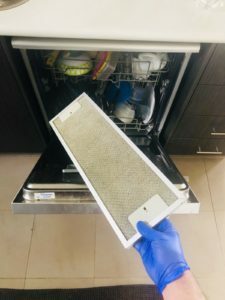 The easiest way we found to clean your range hood filter is to put into your dishwasher. Please read carefully your owner’s manual, though, to make sure either your filter or dishwasher will not get damaged for any particular reason. Select the heavy duty option from your dishwasher dashboard and let the machine do the hard work for you. The combination of hot water and high pressure water is ideal for this kind of cleaning. When the cycle is completed, all you have to do is dry it properly as the filter will probably retain water. Then you can just place the filter back again and it is all clean and ready to be used (free of germs and bacteria). So now you know! When someone ask you if you can clean a range hood the answer is YES! In order to keep it clean, the best practice is to clean your range hood at least once a month. Simply repeat the process explained above and your house will always look great and be free of nasties.